reminded me to post this photograph taken two weeks ago of Renzo Piano’s “Modern Wing” for the Art Institute of Chicago. Looking west on Monroe Street. People in Chicago are already buzzing about the size of the thing, since it is west of Michigan Avenue, in Grant Park. The built city used to stop at Michigan Avenue. East of that was supposed to be parkland. Now on Monroe the buildings seem to extend out in the park toward Lake Michigan another couple of blocks, all the way to Columbus Avenue. It will be elegant. 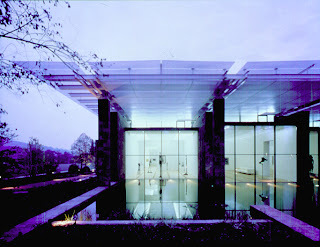 Renzo Piano’s museum buildings almost always are. In design drawings, the modern art wing that Piano designed for the Art Institute of Chicago resembles three Beyelers stacked atop each other. Will the aloof, elegant structure transcend its model to reveal the Art Institute anew and engage an urban setting that’s got everything — skyline, park, lake? We’ll find out in May 2009, when the wing opens. Piano has benefited from a trend away from sculpturally expressive museums to bland designs that are invariably described as “architecture serving art.” It’s true that spectacular atriums and strangely shaped galleries can make displaying art more difficult. Yet the best of them freshen our vision. Piano’s L.A. County Museum of Art, due to open next week, does looks bland on the outside. His California Academy of Sciences, to open Sept. 27th in Golden Gate Park in San Francisco looks anything but bland. And the Art Institute of Chicago wing is appropriately somewhere in the middle. But this great facade facing north seems to want to have open space in front of it. It “asks” for Monroe Street to be closed. That would also connect Millennium Park to the Art Institute with green space. Instead a bridge over Monroe, designed by Piano, is planned. I can’t wait to see this thing lit at night. You are currently browsing the archives for the James S. Russell category.